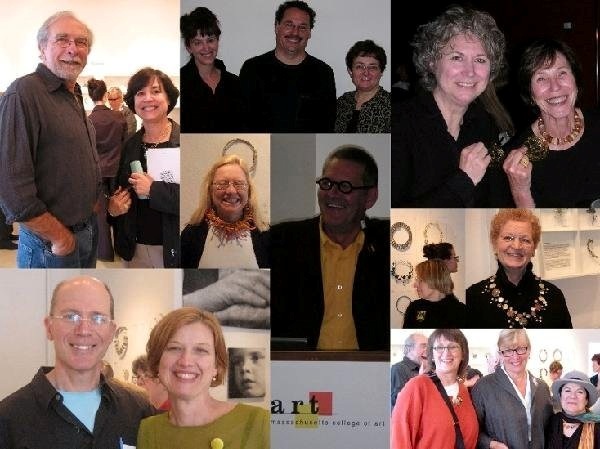 An enthusiastic group of 23 AJF members gathered in Boston in June 2007 to enjoy three days of non-stop art jewelry activities. Like all AJF tours, the days were filled with gallery events, artist presentations, studio visits, stimulating lectures and museum openings. And, as has become the custom, busy days ended with convivial and delicious meals. We started on the first day with a private showing of Jamie Bennett’s work hosted by Sienna Gallery. Sienna Patti, the gallery’s founder, invited Bennett to discuss his work and asked decorative-arts curator Jeannine Falino, who is authoring the book that will accompany an upcoming retrospective of Bennett’s work, to comment on the significant role Bennett’s work plays in the history of American jewelry. We combined lunch with a tour of the innovative new Institute for Contemporary Art (ICA) museum on the Boston waterfront and an exhibition of work by Louise Bourgeois, one of our most influential living artists. It seemed we went from one high point to the next, with a rich and varied afternoon as guests of Massachusetts College of Art. With metals professor Heather White as our host we toured the metals studio, visited with students and viewed a display of student work. Then we were treated to a lively and provocative lecture by the renowned Dutch master artist Ruudt Peters, which was followed by a gallery reception and exhibition of his latest Sefiroth series and work by MassArt faculty and alumni. Early the next day we were off to Dan Jocz’s studio. Everyone enjoyed seeing Dan’s workspace and his engaging description of his creative and technical explorations. His demonstration of how he electromagnetically applies the fiber flocking to his bracelets was fascinating and fun to watch. Dan joined us as we traveled to Mobilia Gallery in Cambridge where owners Libby and JoAnne Cooper had invited many artists to join us at the gallery for a casual lunch. We took in the featured exhibitions by Jennifer Trask and Joyce Scott. Jennifer discussed her inspiration and motivation for her provocative new body of work. Joe Wood, artist and MassArt professor, discussed faculty work and the university metals program. And, befitting our passion we spent a good amount of time eagerly exploring the gallery cases and drawers. Back to Boston, where at the Museum of Fine Art we were greeted by Kelly L’Ecuyer. Kelly is the curator who worked closely with Daphne Farago to transfer her extensive collection to the museum. As she conducted our private tour of the first exhibition entitled Jewelry By Artists: The Daphne Farago Collection, she explained the wide-ranging plans the museum has for the collection. She also described how Farago was convinced of the artistic importance of the work and felt from the beginning that the collection should be housed in a fine arts museum which placed the jewelry in a large cultural context. Later that evening our group returned to the museum for the official opening reception to celebrate with the many artists, collectors and educators. As our trip came to a close we celebrated by sharing a wonderful meal together and gave a thankful toast to Pat and Susan for organizing such a terrific trip. As Orson Welles once said, 'If you want a happy ending, that depends on where you stop the story.' So, on a happy note we ended our trip to Boston. Next: Houston!